Ice Axe Expeditions Polar Training Course is the perfect next step for those who wish to explore the Arctic and Antarctic. Graduates of this course will be well prepared for longer, more complex expeditions, such as the North Pole and South Pole. 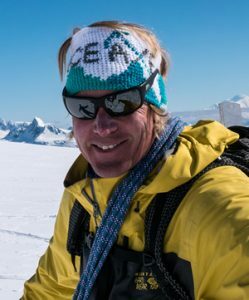 International Polar Explorer, Doug Stoup, has led more expeditions to the poles than any other person on the planet, and has refined countless aspects of polar travel. His 20 plus years of experience and innovation is the foundation of this course. This is the first time that Doug has decided to pass on the specific tools of the trade to individuals interested in taking a deeper dive into polar travel and experiencing polar life. Our one week course will consist of a training expedition, supplemented by classroom time. We will make a push of about 40-50 km (25-30 mi) from Longyearbyen to Templefjorden across moderate polar terrain and return. Svalbard is the ideal training ground for polar expeditions. It is located halfway between continental Norway and the North Pole, and is the base for most North Pole Expeditions. Svalbard itself is an extreme environment, home to many of the same harsh conditions that people are exposed to on expeditions to the poles. It is ideally located and home to the Svalbard Airport, Longyear (LYR), a 4 hour one-stop flight from Oslo, Norway. Doug continues to travel the poles, pushing the limits of human endurance while raising funds for charities, collecting scientific data for climate change scientists, and leading disabled adventurers to the polar environments. His experiences are as unique and uncommon as the messages he imparts to others. It’s only through immense focus, perseverance, and hard work that Doug has accomplished the unheard of feats throughout his career. Sharing the challenges, achievements, and lessons of his adventures through keynotes, workshops, and actual expeditions is one of Doug’s principle rewards. 2016: First Snapchat Global Story, ever, from Antarctica documenting the Pole of Hope expedition. Douglas guided Aron Anderson, a paraplegic Swedish explorer, from the coast of Antarctica to the geographic South Pole. This expedition amassed 14 Million total views and raised $640,000 for a Swedish non-profit combating childhood cancer. 2014: Doug currently holds the World Speed Record for crossing from the coast of Antarctica to the geographic South Pole on an unsupported ski expedition with Parker Liautaud: Completed the 437 miles in 18 days 4 hours and 33 minutes. Douglas worked with ESA (European Satellite Agency) on Operation Ice Bridge, a project where Doug placed beacons on the ice while on expeditions to the North Pole to track the movement of ice. Douglas first ski and snowboard descent of Vinson Massif, Antarctica’s highest peak. 2014, Douglas led and starred in Animal Planet’s #1 show, Ice Cold Gold. They filmed near Illulisat, Greenland for 2 months. Douglas guided the Warren Miller Entertainment crew for the 65th movie Flow State to SW Greenland for a ski adventure with all star cast of America’s Fastest skier Ted Ligity, Michelle Parker and Mark Abma. They skied new descents near Maniitoq and Sisimuit, Greenland. This was Doug’s 5th Warren Miller movie. 2012: Douglas was the expedition leader/guide for Push Expedition. An expedition where Doug led the first paraplegic athlete to the South Pole. 2012, Doug was the expedition leader/guide who led 16-year old Parker Liautaud as he successfully became the youngest person to complete a Last Degree expedition to the Geographic North Pole. 2007, Douglas lead the Shackleton South Pole Expedition— Lead team 673 nautical miles from the coast of Antarctica to the Geographic South Pole. The 48 day expedition was the first new route to the pole attempted in 10 years. 2005, Douglas lead the expedition, Pole Track — Teamed up with Marc Cornelissen and Peter Nyquist on an international North Pole expedition to support climate change research. Three weather stations are deployed and collecting valuable climate data. Upon Completion of Ice Axe Polar Training Course, Participants will be presented with a certificate of completion to be used for application of Antarctic or Arctic Expedition in the future as well as a jump drive of professional quality images.